Young mother Laine Forrester travels to France in November for a dear friend Ellie's wedding. Her own married life is crumbling back home, and among the cheerful crowd, she encounters the brother of the groom, Cormac Foley from Dublin. 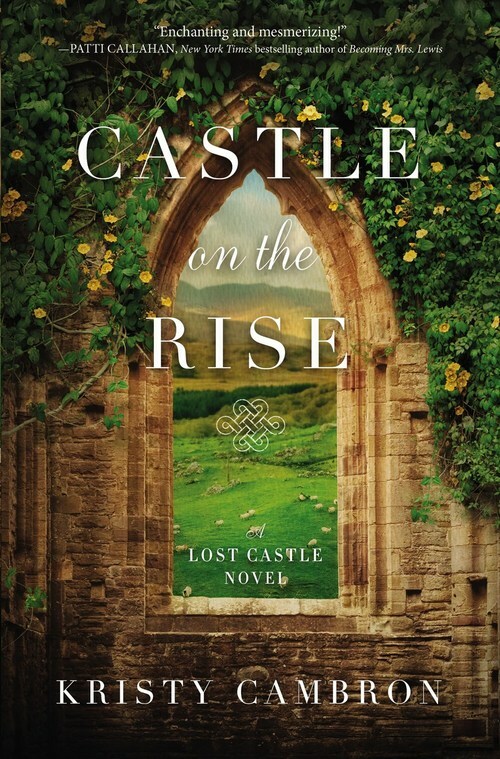 This is the second book in the Lost Castles series, and I love the title: CASTLE ON THE RISE, as many castles were built on a height while also alluding to the Easter Rising and 1798 rebellion. The book slips back to a 1915 timeline, set in Dublin. At this point, Ireland was still part of the British Empire and the men were called to the Great War. Isolde Byrne from Ashford Manor meets Sean O'Connell in the Abbey Theatre, a haven for socialites. Tonight, some keen revolutionaries are in the audience, including Patrick Pearse and Countess Constance Markievicz. But Isolde has closer troubles to concern her when her best friend Honor confesses she's in a tricky situation. The scene shifts again to the Wicklow Mountains, where Ashford Manor lies snow-covered at the end of 1797. Lady Maeve Ashford pursues a thief who has stolen her father's fine stallion. While horses are working animals in 1915, they compete with motor delivery vehicles, but back in 1797 a horse, like Maeve's mare Eire, is the only means of transport. I enjoyed the glimpses of the past, alternating with Laine's modern trials. The three women are all independent minded and forward thinking. For instance, Isolde is using a new Eastman Kodak camera she bought with what should have been her dress allowance. The build of division between the Anglo-Irish and the native people, with the British unsympathetic from across the Irish Sea, is well portrayed through conversation, and acceptance that the two societies don't often intermarry. The Wicklow castle of the title is a ruin already in 1797, and in 1915, with no jobs paying decent wages, people move to Dublin. Laine is drawn there with her friends Ellie and Cormac to deal with an inheritance issue. I also enjoyed the presence of a traditional Dublin pub in each tale, the ideal spot for meeting friends and well placed to observe the Easter Rising. This bitter and dramatic armed conflict is the subject of Isolde's new career of photojournalism. The modern tale is less dangerous but intensely personal, and all three women long for freedom and happiness in their lives. Author Kristy Cambron describes at the end how she came to Dublin to carry out her research, walking in the paths of the characters. I'm delighted that she did, as a Dubliner, and the strong theme of Irish women will find many friends among the book-loving community. CASTLE ON THE RISE is a vibrant tale of change and determination, of love against the odds and eventual victory. When Laine Forrester travels overseas to attend her best friend�s vineyard wedding, she expects to find the bride on the brink of a fairy tale life. But after a series of unforeseen setbacks, it seems the storybook lives they�d imagined are suddenly ripping apart. With hopes of resurrecting a happy ending, Laine agrees to accompany the newlyweds to the groom�s home in Ireland� never expecting she�d be the one drawn in by its wide-open moors, backroads bordering the Irish Sea, and a mysterious castle that dares to keep its secrets hidden. From the storied streets of Dublin to the shores of the Emerald Isle, Laine is drawn in to the land and its rich history. The castle ruins whisper stories of Issy�a photojournalist battling through the 1916 Easter Rising, and Maeve�the castle�s lady of legend, fighting for survival through the 1798 rebellion that started it all. Spanning more than two centuries, Castle on the Rise unites the legacy of three women who must risk mending the broken places within�for life, love, and the belief that even through the depths of our pain, a masterpiece of a story can emerge. Laine accepted a wedding in France, though beautiful, for what it was: an escape from the life crumbling back home. Now was not the time to share her brand of advice. Or brutal honesty. The story of a broken marriage and uncertain future would have to wait its turn. Maybe she could come clean when Ellie and Quinn returned from their honeymoon. Or in the spring, when life had settled down. By then, Laine and Cassie would be back home�in a new home. She could face the truth when it felt safe to pick up the pieces and start again. It was a battle, but Laine shoved the ache away. She held on to her smile with everything she possessed and stood back, marveling as Ellie dropped her train�satin and lace absorbing the glow of light from the chapel door. They paused together, the snow drifting in a dance around them. �Live every moment. Yes.� Ellie half laughed, then paused and cast her gaze off in the distance. She creased her brow. Deep. Like she was lost somewhere else for a breath. Funny, she always did that just before she . . .
�You�re right. No tears now. Not even the happy ones.� Ellie inhaled deep, then let it out in a fog of frozen breath.